How do I change the look of my blog? HELP! Libby is a independent journalist ready to flee her life in the big city of Atlanta. After being dumped by her boyfriend, she moves to farm in Lackaduck, Wyoming. She hopes this will be a cure for the blues and get a much needed rest. What she doesn't expect is the attention of a hometown cowboy and the local sheriff. Luke is the dreamy cowboy neighbor who stops by unannounced and butts his way into her life. Cash is the confident sheriff who is taken by Libby and wants to help her in any way possible. What connects them is Libby's new job (as a reporter for Lackaduck paper) and a cold case of a local missing girl from 2 years ago. Libby is determined to solve it and bask in the only real news that goes on in the small town. With Luke and Cash and a host of other small town characters, Libby sets off on a mission to find Della, the 17 year old missing girl. 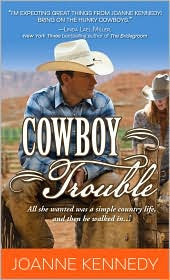 What you get with Cowboy Trouble is a bit of romance but actually quite a bit of mystery too. Though the characters all collided pretty early on, it was a slow start for me. I didn't feel convinced of Libby's place in the small town and at her farm. Her back and forth with Luke happened too quick and her acceptance by the other characters did not scream real to me. But as I read on, the characters were fleshed out a bit and you learn more of the case and the politics of the small town and it got a lot more interesting. Libby was a hoot and I enjoyed her romp with Luke, though it took a bit too long in my opinion. I liked reading her adventures of trying to survive on the farm and adopting a litter of dogs that drive her crazy. She was fun and spirited. It got better as the story went on, becoming more of a mystery. I thought for a first time novel, it was enjoyable. I have not read any cowboy themed romances or novels before and it wasn't over the top. You got that Luke was a small town boy who had the cowboy qualities but he seemed like a genuine character to me. For fans of this genre it would be a decent, enjoyable read. For some one new to the genre, it didn't WOW me but I enjoyed it enough. Thanks to Danielle at Sourebooks for sending me a copy to read and review. I just saw a review of this on another blog this morning. I am intrigued. Nice review. Not normally my type but there is something about the hat that is hot, the books sounds interesting as well.